China, who were stopped at the quarter-final of the Badminton Asia Junior Championship mixed team event, regrouped to take home two titles from the individual competition held in the Jaya Raya Sports Hall Training Centre, Tangerang Selatan. Korea, Malaysia and the home team Indonesia shared out the remaining three titles. Story and photos by Mathilde Liliana Perada, Badzine Correspondent live in Tangerang Selatan. The Chinese boys’ doubles pair of Di Zijian / Wang Chang (pictured left) beat #2 seeded Lee Sang Min / Na Sung Seung 21-19, 21-11 after just 35 minutes of playing. 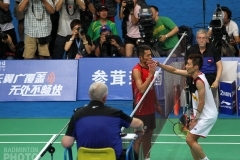 After the match, Wang Chang told Badzine that it was an exciting game and he felt really happy about winning. It was not all smiles, however, as the Korean boys were really upset about their performance: “We didn’t perform well today. Unfortunately, we couldn’t play all out and my body felt heavy to move,” said Lee Sang Min after the match. 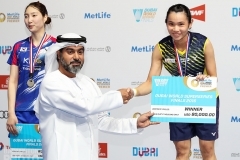 In the girls’ singles match, Han Yue (pictured right) brought the second title home for China. She took the first game 21-15 against Pattarasuda Chaiwan, but trailed 10-11 in the second before scoring 9 consecutive points after the interval to end it 21-13. “I didn’t expect to win in this tournament. My opponent is younger than me so I played her well. 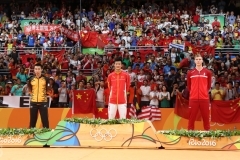 I felt relaxed and enjoyed the match,” the 18-year-old Han explained. 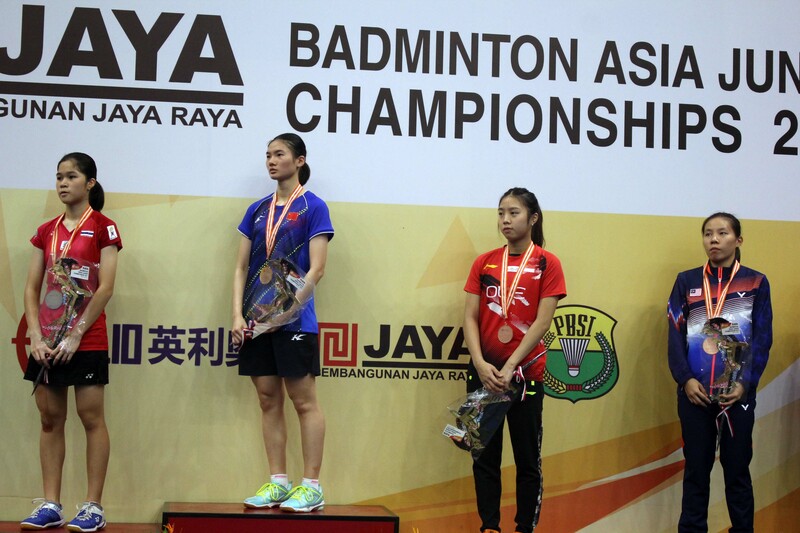 The Koreans Baek Ha Na / Lee Yu Rim (pictured left) showed their superiority at the Asian Junior Championship by winning the tournament without losing a single game after the first round, upsetting China’s Liu Xuanxuan/Xia Yuting by 21-12, 21-19 in the final. Lee, who lost narrowly in the mixed doubles finals at this event last year, was able to go one better this time. Her regular mixed partner Kim Won Ho, made up for his runner-up finish last year a few weeks ago, when he took his first Grand Prix title with a veteran partner. “I’m very grateful to our coaches. 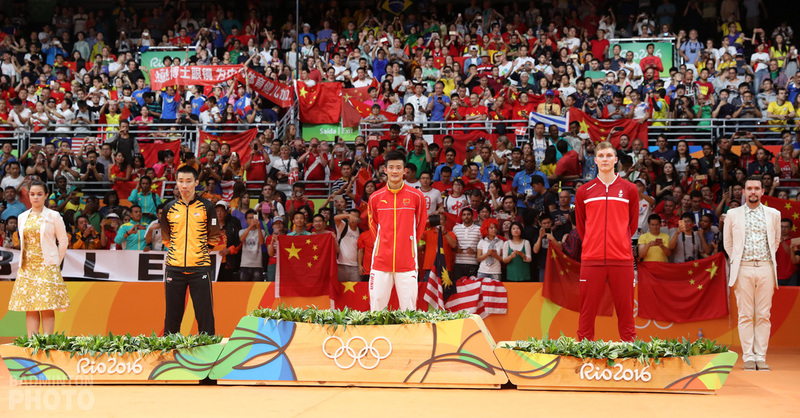 This was the most exciting out of all the matches,” Baek added. Unfortunately, their compatriots Na Sung Seung / Seong Ah Yeong couldn’t get the same result, losing to home favourites Rehan Naufal Kusharjanto / Siti Fadia Silva Ramadhanti (pictured right) in the mixed doubles final. The points of both players were tight in the first and second games, but the Indonesians took over in the decider and took the title after one of Na’s returns went wide. “I was pessimistic about our chances to win after finding out that there were three Korean representatives in the semi-finals but we tried to focus on one match at a time, and finally we did it,” said Kusharjanto. 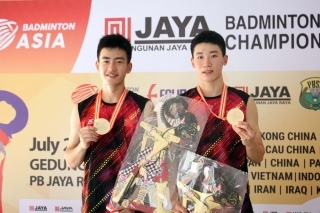 The last title went to Malaysia after Leong Jun Hao (pictured left) beat China’s Bai Yupeng 21-6, 20-22, 21-17 in 74 minutes. 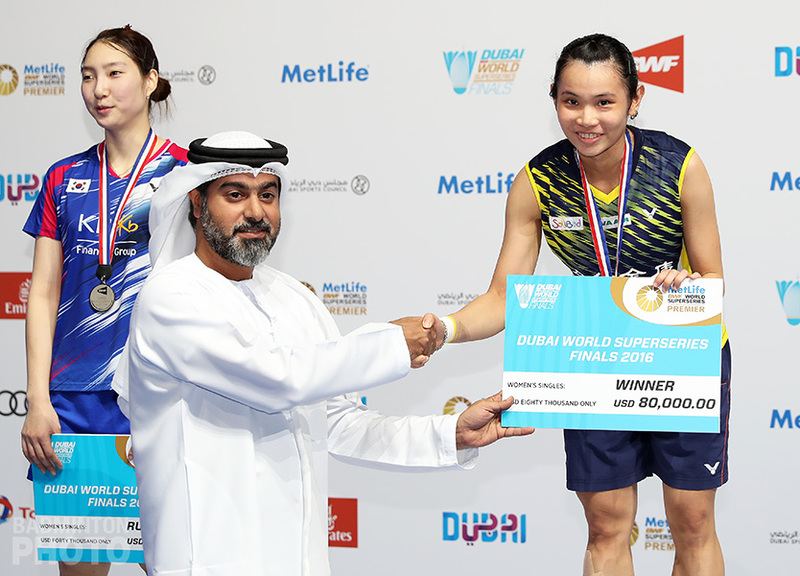 “In the first game, I felt I’d prepared well and got an easy game but when I was leading in the second, I felt a little bit nervous and I wanted to play fast but I lost some critical points,” said Leong. 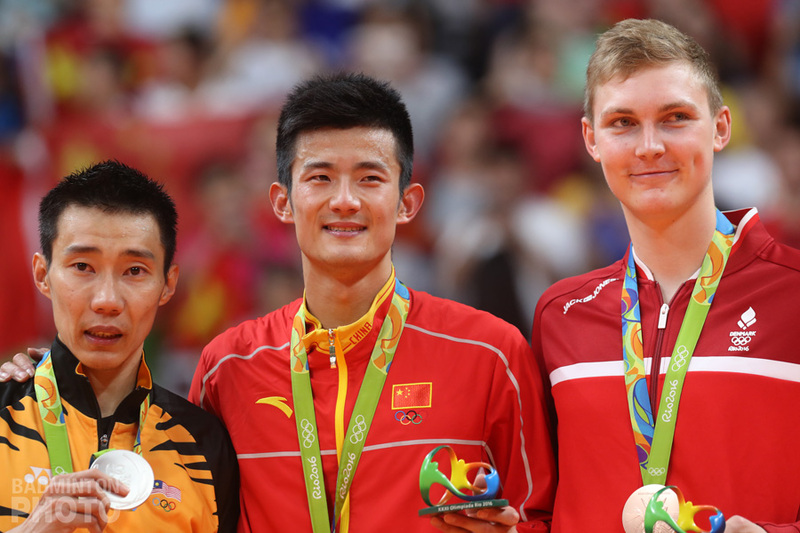 “In the third game, I tried to give it my all on the court and finally won the match. Leong thus took back the title for Malaysia after four years. Soo Teck Zhi, in 2013, was the last Malaysian winner in boys’ singles at the Asian Juniors. Leong will no doubt be looking to emulate Zulfadli Zulkiffli’s last year as a junior, as he followed up the continental win with Malaysia’s only World Junior title ever in the discipline.